I confess, the idea of creating a mission statement for myself or my family seemed like a "touchy-feely" getting to know you kind of concept. I know what I believe, I know what is important to me in my life, why do I need to formalize it in writing? However, my husband has encouraged me to do just that, and with his prompting and my reading 7 Habits last year (I am still slogging through the family version - so much to digest), I became convinced of the advantages. I will say, it was not an easy thing to do. How do you boil down who you are and what your "mission" is in a focused way? After much thought and jotting down of ideas over several weeks, I came to the conclusion that the structure of my mission statement would be based on the 5 P's from Mother's Rule of Life. Those five areas encompass everything I wanted to define in my life, so I took each one and wrote a paragraph stating who I am and what I am striving for within each of those realms. While I realize that I will fall short of this daily, it is a good reminder of that which I am striving to attain, and a good check for myself in evaluating what activities to pursue. So, I want to encourage you if you are at a point where you feel lost, directionless or overwhelmed (hee hee, that probably describes us all right! ), then take time to create a mission statement. It can be very revealing, and it certainly can help to focus your priorities. If you are not sure how to go about it, pick up one of the 7 Habits books, there are ideas there as well as examples of others' mission statements. My little princess turns 8 today. We are having a joint birthday party after Pascha for her and the crocodile hunter (he gets to celebrate turning 10 on Holy Pascha this year!). So since I don't have any party photos for this year, I decided to post some from her birthday last year that I never got around to posting :) Now, I am known for going overboard when it comes to party planning, but since we don't really buy them a gift for their birthday (with 5 sets of aunts and uncles and 2 sets of grandparents, it really is not necessary), I consider the party to be their gift. Not to mention it's just so much fun! 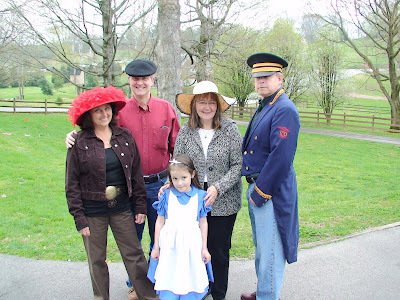 Last year she wanted an Alice in Wonderland party, which is a great theme to work with. For invites I found a great picture of the White Rabbit and printed that off my computer, then backed them with a layer of red paper and a layer of gorgeous black and white diamond paper. Party favors were easy, since her birthday the month after Valentines day, I got lots of great heart related things on clearance - lollipops etc, and found really cute flamingo gummies and miniature playing cards from Oriental Trading Company. The cake was the most fun one I have made in years. I saw something like this years ago at an ICES convention and always hoped someday to recreate it. 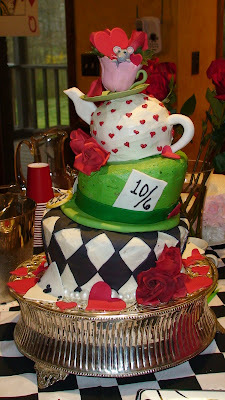 The entire cake is edible, even the tea cup, mouse and roses are made of gumpaste and fondant. We don't invite lots of friends, usually it is just family and one friend invited, but since there are 10 cousins it is quite a group. The guests came in their maddest hats, and the birthday girl had her very own Alice dress (completed by a very tired mommy at 2:00 am the morning of the party). 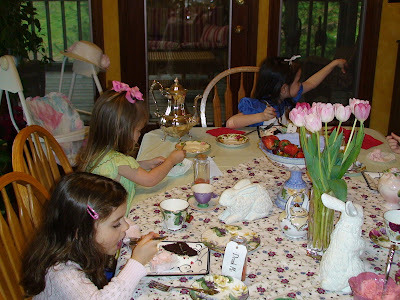 The food was of course traditional tea fare - devonshire cream and scones, raspberries, cucumber and watercress sandwiches, lemonade served in tea cups and cookies that said "Eat Me". And to finish it all off, a round of flamingo croquet (put pink socks over croquet mallets, and set out a few flamingo lawn ornaments among the wickets) on the very wet and dreary lawn (weather is not very cooperative for March birthdays!) So that was a peek at last year. This year - Charlotte's Web! Some of you may have known Mary from a previous blog - I used to love reading all of her wonderful ideas. She is the reason I started blogging - when she closed her blog, I was so sad to see such a great resource gone, and that inspired me to share my own ideas with others. Her blog introduced me to Waldorf style learning and wonderful ways of incorporating that into our school day, and she created wonderful projects for commemorating the many feasts of the church. Well, she is back and I just stumbled upon her again - so go check it out. This is one blog you will want to bookmark! I still had a few butternut squash left over from last fall (who knew butternut squash would keep that long?) In an attempt to use them before they finally went bad, I found two great recipes I wanted to share, both of which are perfect for Lent. The first is a wonderful soup - made even better with the addition of some heavy whipping cream garnish during those non-fasting periods. The second, a pasta dish (just leave off the parmesan and use margarine not butter) even the kids enjoyed. These were not hard to make - and I made them both for company a few weeks ago - the soup can be made up early in the day then rewarmed, and the pasta takes about 20 minutes to cook. Dear Lord, this bread that we have baked represents each one of us in this family and in our parish. We are offering ourselves to Thee, our very life, in humble obedience and total commitment. We place ourselves on Thy holy altar through this bread to be used by Thee in anyway that will enlarge Thy kingdom. Accept our gift and make us worthy to receive the greater gift that Thou will give to us when Thou consecrate this bread and give it back to us as Thy most precious body. Amen. hilarious article! WARNING - "facetards" may find offense at the linked article. Those of you who still resist the "the Borg" will find it side-splittingly hysterical! I am so very blessed! I have spent all of clean week at an icon workshop, and wanted to share my experience. This is the second workshop I have had the opportunity to take (the first was taught by Susan), and the timing for this one could not have been more appropriate. Learning to paint/write an icon is such an amazing and humbling experience. There is a closeness to God that I cannot describe, and an overwhelming sense of unworthiness as I attempt to allow Him to work through me. The workshop was from 8:30-4:30 each day, then I attended clean week services each night, so I feel as if I have been immersed in the life of the church in such an amazing way this week. We finished today (though my icon still lacks a few finishing details before blessing), and how appropriate to leave the workshop this afternoon and go to the Akathist to the Theotokos whose image I have gazed upon all week. Even more exciting is the thought of having my newly finished icon in time for Sunday of Orthodoxy, the time when the Orthodox church celebrates the defeat of the iconoclasts and the reaffirmation of the place of icons in the church. I cannot tell you the love I feel right now for the holy Theotokos, and the amazing beauty of this icon - one of the few that depicts any emotion. The prototype is The Virgin of the Passion, and it is the image of Mary, pointing Christ towards His path - the angel on the right holds the cross and nails, the angel on the left holds the spear that will pierce His side, and the sponge and vinegar offered to Him at the cross. The Christ child grasps His mother's thumb in a moment of anxiousness, and the face of the Theotokos shows her sadness in knowing she will some day have to let go of Him and witness her Son sacrificed for the world. As a mother, my heart aches for her, and as a sinner, my heart thanks and praises her for her strength and willingness to answer God's call, to bear, raise, and witness the death of her precious Son, the Son of God, that we may live through his glorious resurrection! Here is a look at the bag I pack to help get us through the long Great Canon Services this week. These items are chosen so the kids can be kept quietly busy while still singing along with the responses to the Canon. The wonderful green book is a homemade coloring book created by the little princess' godfather (Erin's wonderful husband). It contains line drawings of every imaginable saint and feast day. The kids enjoy coloring these, and they also love to take blank sheets of paper and trace the images - great practice for future iconographers :) I try to rotate out a good selection of books, preferably ones that pertain to Lent or Pascha, but not always. (My favorite new book right now is The Man and the Vine - a beautifully illustrated rhyme about a man growing the grapes for the Eucharist wine - it is a very moving children's book). The crocodile hunter likes to have a prayer book, and the Queen has crayons and a few small wooden figures to play with. All of the books you see are available through St. Nectarios Press or Conciliar Press.